Embark upon one of our Social Justice Trips and achieve better opportunities, fair wages, and a higher quality of life for people all over the globe. This is a fantastic opportunity to interact with the true fabric of a community, an opportunity that socially conscious students just can’t afford to pass up. At ILI Travel, we can help college students plan a Fair Trade Service Program abroad. Visit and support non-profit organizations providing life-altering service for some of the most marginalized people in the community. Target the specific needs of the communities, as determined by the people themselves. Contribute to economic sustainability by staying in locally-owned hotels and eating in locally owned restaurants. The money we spend there stays there. Contribute to educational sustainability by volunteering in the schools to provide extra teachers, tutors, and light construction volunteers. Contribute to environmental sustainability by helping locals become more self-sufficient in agriculture. Contribute to job growth by hiring locals to serve as our Field Director and other important positions. Our Field Director, an experienced educator from the country, will facilitate or co-facilitate reflections of our program each night to ensure we do not have a purely American perspective on our experience. Reflections are a critical component of our social justice goals. Our programs – available for groups from Essex County, NJ, to Montgomery County, PA, and beyond – transport students to our locations in the Dominican Republic and Haiti, where we focus on the needs of locals first. Americans travel to Haiti in large numbers for faith-based support, and our program allows a secular program for those who choose. Visit Haiti volunteer opportunities for the full list of activities. Touring a Dominican prison and meeting with a nonprofit organization that works to help former inmates get reintegrated into society. Meeting with a nonprofit working to reduce and eliminate the trafficking of women. Volunteering for a nonprofit working with girls living in extreme poverty. Visit Dominican Republic volunteer opportunities to learn more. What does the price of ILI’s Volunteer Trips for College Students include? How will we contribute to locally-identified needs through Volunteer Trips for College Students? Working side-by-side with locals from community-based organizations. Volunteering in a public school or with a non-profit organization. We focus on their identified areas of need. Working directly with children (eg, teaching English, playing sports, art projects). Working with the environment (eg, protecting the coral reefs). Staying at a family-owned hotel so that our lodging dollars remain in the community we serve. 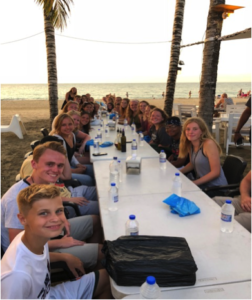 We will find time after our program to experience the clubs, bars, and beaches in the Dominican Republic. In fact, one day will be a specific outing, usually to the beach, for our group. Each day will be busy as we learn and grow, but there also will be time to enjoy much of the beauty of the countries we visit. This program is available to groups from Montgomery County, Union County, Warren County, Bucks County, Essex County, Burlington County, Chester County, and other locations in PA, NJ, and beyond. Our college social justice trips abroad enable students to experience countries from a different perspective than Americans typically experience. Americans spend a lot of money at resorts in locations abroad, and too often, very little of that money reaches the people who live in that country. By contrast, ILI volunteer programs support the community, partnering with local people with their feet on the ground. Participants will grow significantly from this trip, and afterward, few will ever visit these countries just for the resorts. ILI forms partnerships with the local community because we are committed to empowering the locals. We are looking to put an end to or reduce the cycle of poverty for the most marginalized people in a community. Contact us to learn more about Volunteer Trips for College Students and our approach to a service learning program and a non-religious mission trip.